Obituary for Joseph A. Daloia Jr. | Cheche Funeral Home Inc.
Joseph A. Daloia Jr., 66, the husband of Eileen King Daloia, of Center Street, Auburn, died Wednesday, Jan. 23, 2019. A native of Auburn, Joe and his wife recently retired and returned to their home town. Over the years, he was employed in transportation logistics by several local companies including Red Star, Stott and Davis and Wadham Enterprises. Most recently he worked at Bass Pro Shops. 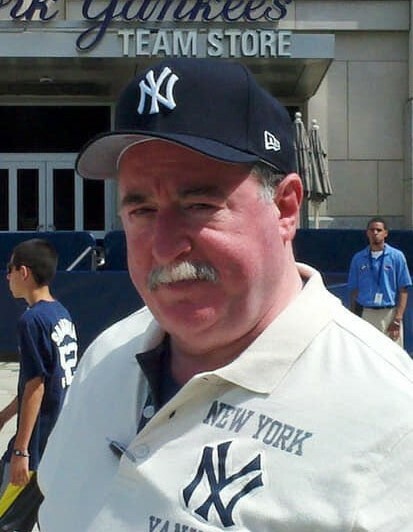 He enjoyed his time in the outdoors hunting and fishing, cherished the time spent with his beloved grandchildren, and was an avid Yankees, Giants, and Syracuse University sports fan. Joe had a passion for cooking, dishing out large portions of home cooked meals to all whom he welcomed into their home. In addition to his wife, Eileen, he is survived by his loving mother, Paula Lamanna Daloia; two sons, Nicholas Daloia (Francine), of Chicago, and Christopher Daloia (Leslie), of Corning; two grandchildren, Joseph Rocco and Charlotte Elizabeth Daloia; five siblings, Gerald Daloia (Bette), of Webster, Sylvia Kott (Steve), of Auburn, Paul Daloia (Jane), of Webster, Maria Bliss (Jim), of Camillus, and Steven Daloia, of Rochester; mother-in-law, Sarah King, of Auburn; in-laws, Patricia King (Roni), of Shelter Island, Kathleen King (John Laing), of Rochester, Thomas King (Charene), of Auburn, Theresa Mattioli (John), of Atlanta, Maryann King (Matthew Rice), of Boston, Ursula King (Blackford Middleton), of Nashville, John King, of Adirondack, and Sarah Reinecker (Scott), of York; 29 nieces and nephews, and three God children. In addition to his paternal grandparents, Rocco and Sylvia Daloia, and maternal grandparents, Joseph and Mary Lamanna, Joe was predeceased by his father, Joseph A. Daloia Sr., and father-in-law, Thomas F. King. Friends are invited to join the family for a Mass of Christian burial to be offered at 10:30 a.m. Monday in Sacred Heart Church. Calling hours will be conducted from 4 to 7 p.m. Sunday at the Cheche Funeral Home Inc., 1778 Clark St. Road, Auburn. Joe was a kind and gentle soul who provided a listening ear, a shoulder to lean on, and always had an open door policy. He took great joy in feeding you, feeding you and feeding you!